I am about to leave on an expedition to climb Mt. Everest. This post should answer some of the questions people have asked me time and again. Q: Are you addicted to danger or something? What’s your major malfunction? A: I am one of the most careful climbers you’ll meet. I go to the mountains in spite of potential danger, never because of it. I guess there is some sort of adrenaline rush on the good days, but never because of the danger, rather because of the thrill of doing things the right way, safely… including the willingness to turn around if things don’t feel right. I have a fabulous family, super friends, wonderful career and co-workers… I am truly the luckiest person I know. I would never jeopardize that on a whim or take any sort of crazy risks. Doug Black and me on top of Mt Aix. One of many fun adventures. Q: What makes you think you can do this? A: I have dreamed of climbing Everest since second grade… and have been training actively for it since 2007. 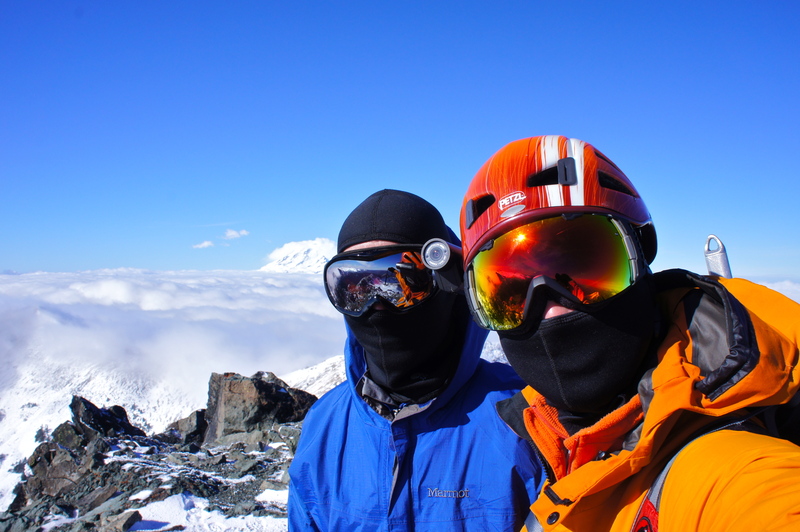 I am a husband & dad, doctor, teacher, mentor… and amateur mountaineer. In that order. My mountaineering CV is thinner than many, fatter than some. 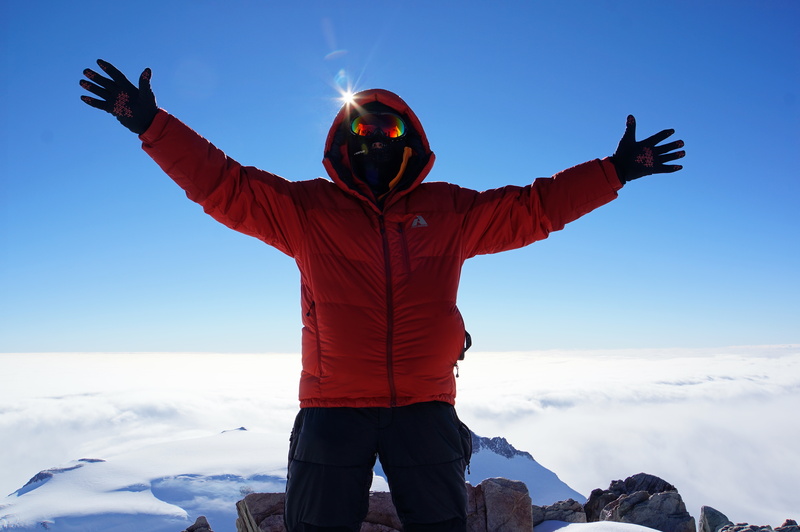 I have learned a tremendous amount in the last eight years, mostly from my amazing mentor and best friend, Doug Black… and loads from all the professional guides with whom I have been lucky to climb. I am totally humble about this process, and even the idea of getting safely to the top and back again seems crazy sometimes. But, I have paid my dues, and have proven that I have the stamina and technical skills and mental focus to perform well up high. Well enough for Everest? I damn well think so. If not, I wouldn’t attempt it. We’ll see. Q: With whom are you climbing? A: International Mountain Guides (IMG), based in Ashford, Washington. They are simply unsurpassed, in every regard. They have guided more people to the top of Everest than anyone else, with a superb safety record. They are true partners and supporters of the Sherpa people, with whom they have created lasting, meaningful, respectful relationships. And, they are excellent stewards of the land. I have been totally impressed with IMG in every expedition (Aconcagua, Mt Blanc, Mt Vinson, Mt Rainier winter seminar). Plus, they seem to like me… we always have a ball. The IMG ethos is one I aspire to… they are always the class act on the mountain, and I am excited to climb with them again. A: This expedition’s price tag is in the middle of a pretty substantial range of prices you will hear about. Many offer cheaper trips, and some more expensive, but in my view IMG provides a superb value for the price; and, after all, safety is priceless. You can find out more about IMG’s Everest programs on their website, please do. Q: Who exactly is on your team? Can I read about them here too? A: For reasons of privacy, I will only blog about myself… No drama, no gossip, just my thoughts and experiences during the adventure. But, yes, I know a bunch of folks up there, not just on my own team, and everyone is amazing. We will have a safe trip, and will have a blast doing it. For overall expedition coverage, please follow IMG’s Everest blog. Q: What route will you take? A: South (Nepal) side. And no, in spite of what you may have read, there is not a “new” route this year…. In order to enhance safety during the icefall crossing, the route will move away from the left shoulder and more towards the center. This will likely increase crossing time, but vastly reduce the risk of injury due to falling ice in the way that led to tragedy last April. Q: Will you use oxygen? A: Oh hell yes. About 2% of climbers are thought to have the innate physiology to climb Everest safely without oxygen. Those people are my heroes! I have absolutely no reason to think that I’m one of them… and I have no strong desire to find out. Climbing Everest will be tough enough doing it like 98% of folks… going without “O’s” is not on my agenda this time. Q: Doesn’t using oxygen feel like cheating? A: Sure… in the same way wearing boots and clothing feels like cheating. Or in the same way that being supported by guides (Sherpa and western) feels like cheating. This is how it’s done, people! Put another way: It’s only cheating if you pretend to hold yourself to a different standard. I have no hesitation using all the latest technology to help me get up and back safely. On my own two feet. Every step of the way. With full acknowledgement of the assistance I’m getting from my friends and guides and gear. That works for me. For a humorous take on this, I refer you to Stephen Colbert… especially 1:20. A: I leave home on March 23, 2015, and plan to be home by June 1. In all likelihood, I’ll be home at least a few days sooner than that, maybe a week sooner. Summit day will be no earlier than May 12. No way to be sure, of course… because we need to wait for a clear weather window before attempting the summit, and that may take days. Our planned schedule is here (I will be on a “hybrid” climb, listed in the far left column). Q: That is a long trip! How does your family feel about this? A: BEST… FAMILY…EVER! They know how important this is to me, and they know how careful I am… and so they support me 100%. I am asking a lot of them… Not sure how I got this lucky. Q: What about work? How can you get that time off? A: BEST COLLEAGUES EVER! Seriously. When I asked for an unpaid leave, everyone was super supportive, including my patients. This will be a hassle for lots of people, and yet they have stepped up in such a nice way. I owe them all, big-time. Q: What if you get sick? A: It happens…. And it can be a real issue up there. I got terribly ill with giardia and shigella last time I was in Nepal, trekking around Annapurna, in 1984. This time I’ll be more careful, slathering myself in alcohol hand rub regularly, will keep my own med kit, and have access to a great medical team through the Himalayan Rescue Association. These guys are amazing, and do lots of primary care pro-bono for the Sherpa guides and their families, please check them out. A: We work hard to avoid this, with careful, patient acclimatization. I’ll use a medication called acetazolamide at bedtime, which stimulates deep breathing by dropping the blood pH. And, we all have access to medications that can help in case someone does develop acute mountain sickness…. But, in that case, we always descend. I have performed well at altitude, and have been sleeping at a simulated altitude of 13,000 feet for a couple months now, but I am humble about this, and ready to take care of myself or my buddies if we get sick. Q: 13,000 feet in Seattle? I’ve been sleeping in a getup like this for a couple of months now. 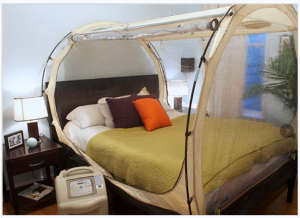 A: A company called Hypoxico makes a unit that depletes O2 from the air pumped into a tent over the bed, or into a mask I wear during workouts. Data supporting its use is lacking, and claims regarding boosted red cell mass are tough to substantiate. But, I have found that I feel more powerful and relaxed on the approach and climb if I “pre-acclimatize” with this system. I call it “Sleeping my way to the top.” It does seem to work for me. Q: How do you train for this, really? A: Best way is to spend time in the mountains. Period. I am lucky to live in Washington, home of the most amazing mountain range in the lower 48. Because of work, I can’t get out as often as I want to… thus, I have also pursued a mix of workouts at home. Most efficient way when time is tight: Running stairs, or running intervals on my elliptical machine (30 degree incline, 50% resistance, 10,000-13,000 foot simulated elevation, 20 lb backpack, sprint a minute and walk a minute, for 45-60 minutes). Plus, old-school weight lifting, pushups, chinups, wall sits, etc. Nothing fancy. Q: Just 20 lbs on your back? A: This ain’t Denali, where we haul 60-120# at a time. Everest is about careful pacing and patience… and not destroying my knees. Yes, I have bad knees, and I want to keep them nimble for the upcoming challenge. Our loads will be lighter on this trip. Conventional wisdom is that you should carry very heavy loads to train, then climb light. It makes sense. But, my experience is that heavy loads are tough on my knees, even in training. Q: What gear will you bring? A: Lots of stuff! The official gear list is here, and it is excellent. I have learned over time exactly what works for me, and what doesn’t, so my version of this kit has been refined over time. You’ll see this stuff in action as the trip continues. Q: What’s your chances of making the summit? A: There’s a 100% chance I will come home in one piece. As for the summit… Official summit rates are 55-75% with IMG in recent years, with excellent safety, which is amazing. I am telling myself 50%, meaning I simply do not know. Q: Are you raising money for a charitable cause? A: There are so many amazing organizations that I have been honored to be involved with, in one way or another. And, I love it when this crazy sport can be turned into something good for others…. But, in this case, my first shot at Everest, I made a decision to climb for my own reasons. I did not want the pressure of letting folks back home cloud my judgement about safety issues on summit day, etc. But, I am delighted to bear the logos and support the efforts of some amazing outfits, including FOP (the Harvard Freshman Outdoor Program) where I fell in love with the mountains (and made so many friends, including my wife), and the East African Diploma Course in Tropical Medicine & Hygiene (in which we train physicians from Africa and around the world every year, in Tanzania and Uganda). I also praise UW Medicine, the amazing place where I work; the ID Society of America, our professional group doing battle with infectious diseases; the Crohn’s & Colitis Foundation of America, which is doing amazing things raising funds for IBD research; and the Shining Stars Foundation, giving hope to kids living with cancer. See… too darn many great causes out there! Q: Can we follow your every move? A: I will carry a SPOT beacon with me… and will keep it on when we are on the move… unless the batteries go out unexpectedly, which does happen! Do NOT be alarmed if the signal goes out, this gizmo is great when it works, but steep valleys can interfere with its performance. You are welcome to track me here. good luck! If you get a chance to hang out in Kathmandu, enjoy! I love reading about your adventures! Stay safe and climb well. I will be rooting for you to reach the top. Thanks Neva, you are the best. Already looking forward to returning to KTM… it has been about 30 years! Crazy…. Thanks Laval! Great to hear from you, and thanks for your nice message! I am thrilled that you are doing this blog, Paul! It does, indeed, answer so many questions that I had. I will be following you every step of the way, cheering you on. And holding my breath till you are safely home after this adventure of a lifetime. Love you! Love you Mom, I will be thinking of you lots while up there, along with the rest of our amazing family. Thanks for putting up with my passion for adventure… the best part is always coming home, I will never forget that. Paul and your teammates I wish you the best and I totally getbin bc doing an ironman for me was the same and thank goodness for your family and colleagues! Be safe! Tamara your ironman spirit will carry us high, thank you! I am humbled. I would wish you the best of luck but you do not appear to need it! I will add a plug for Yale School of Medicine whom should be proud to claim a graduate like you. You are amazing Tamar, thanks! I will sport the blue & white Y on top, I assure you… photos to follow. So lovely to see your family thriving, by the way! With you every step of the way, Paul. Enjoy the beauty and serenity, and knowing you are somewhere few will ever see. You will inspire your kids and many others just by walking. Be really careful. We are all cheering you on! I promise I’ll come back, safe & sound! You are the best mother in law I could imagine! Have a great trip, and enjoy every moment! We’ll be cheering you on from here! Thanks Tracy! Appreciate your support! Very inspiring Paul! Will be following avidly and praying for your health and safety. Glad to know FOP will be so well represented at the top of the world. Thank you David! Yes, wearing my FOP patch with pride! Appreciate your interest and support. Hi Paul! Our family wishes you all the best on this amazing adventure! We’ll be following your blog and Mike is asking me if he can now go on a 2 and a half month trip 😉 Enjoy the journey! Yes. Yes he can… if his lovely wife says so! You guys are BIZZY with more important things now, I think! So pleased to hear from you, and please give my best wishes to your whole crew.